Each fall we kick off our busy season with a whirlwind 4 days onsite at the Pentagon in Arlington, VA – and this year was no different. We are honored to have partnered, for a second year, with The United States Army in producing its annual Army Ten-Miler Road Race. The annual event, celebrating its 34th anniversary in 2018, attracts over 60,000 total attendees and 900 race teams including military, civilians, and wounded warrior athletes - the fastest growing race of it’s kind – continuously selling out year over year. From the load-in and set up itself, which spans a continuous 48 hours until the first runners begin to arrive at the Pentagon imprint at 5am on race day … through strike – taking nearly 18 hours from the time the North lot reopens at 1pm after the race -RGI’s full staff is engaged to ensure the infrastructure necessary for an event this size and scale is seamlessly constructed and artfully executed. The scale and scope of the supplier team necessary to create the event is mind boggling – the list above doesn’t even scratch the surface of the logistical ballet we must orchestrate to pull off this project – then add into the mix coordinating with the services such as medical, power, sanitation, safety – before we even get to the race itself! – We’re exhausted all over again just thinking about it! We truly do love this project – not only does it give us the ability to show off in a real way what RGI does best – which is manage logistically challenging projects with style and ease – but the team at the Army Ten-Miler are some of our favorite clients – the passion and organization they bring to the table make working with them an absolute dream. Many of us at RGI come from a long family history of service. This event - and all our events where we work alongside military service branches or organizations that support our military service men and women are particularly rewarding for us – we salute all our vets – and thank you for your service! Our Principal, Rachael Glaws’, Grandfather, John Peter Glaws II – a fighter pilot in WW II – and recipient of the Distinguished Flying Cross, alongside one of his planes on mission in Europe. At RGI we challenge ourselves to put a unique stamp on each client’s project and let their messaging shine through - from the larger more obvious aspects of design, like the build-outs, lighting, florals, and linens; to the tiniest detail – it’s essential to us, and a pillar of our design strategy, to make sure the client’s messaging saturates in subtle ways and their identity takes center stage. With this particular event, we strove to take identifying pieces of the company’s brand and integrate that into event concepts in surprising and unexpected new ways to coincide with the events overall theme. Far from just putting the company logo on a napkin - our team wanted to take the client’s love of bourbon and play on the venue that the event was being held. Though Ivy City is home to several distilleries, Republic Restoratives certainly brings many new elements. Owned and operated by two women, the distillery was once the largest crowd-funded distillery in the world, raising the capital to open largely from its online network. Now open, the resourceful owners have a rugged space that is perfect for DC locals – simple, yet industrial in design. This fit our client perfectly, as a women-owned government contracting firm celebrating its 20th anniversary. With over 200 ppl in attendance the evening went off without a hitch, celebrating clients and employees alike. Beginning with brief program, guests were treated to cocktails, hors d’oeuvres, and entertainment that didn’t end until well past midnight. While items like ice cubes may seem minute, they are the details your guests will remember (and are a great subject for a social media photo). Venue: 39 restaurants in the 14th St and Penn Quarter neighborhoods + a pop-up at National Union Building, and after-party for MGM National Harbor at Studio Theatre. Theme: José Andrés’ annual summer culinary event, Dine N' Dash brings thousands to ‘dine-n-dash’ at numerous locations throughout the city. Focus beginning with curated menus but ultimately being the philanthropic aspect - raising life-changing funds for the work that the chef’s nonprofit, World Central Kitchen does. RGI's Favorite Creation: MGM National Harbor sponsored the DND afterparty where we created a fine art driven replication of this local resort’s gaming food and beverage offerings as a pop-up environment at Signature Theater. A particular favorite aspect, was our artist painting a live rendering of the event in real-time as it was happening. Biggest Challenge: Simultaneously prepping, setting, and opening 39 logistically spread out event locations – some with lengthy and complicated set-up parameters – opening at the same time across the city. It required an immense amount of organization, strategy, and management of volunteers and staffing to ensure seamless execution. Also, how we shuttled all attendees across both corridors in managing transportation throughout the evening – such as branded buses and pedicabs. A lot to be included in a few short hours but, luckily, that’s where RGI thrives – under pressure. 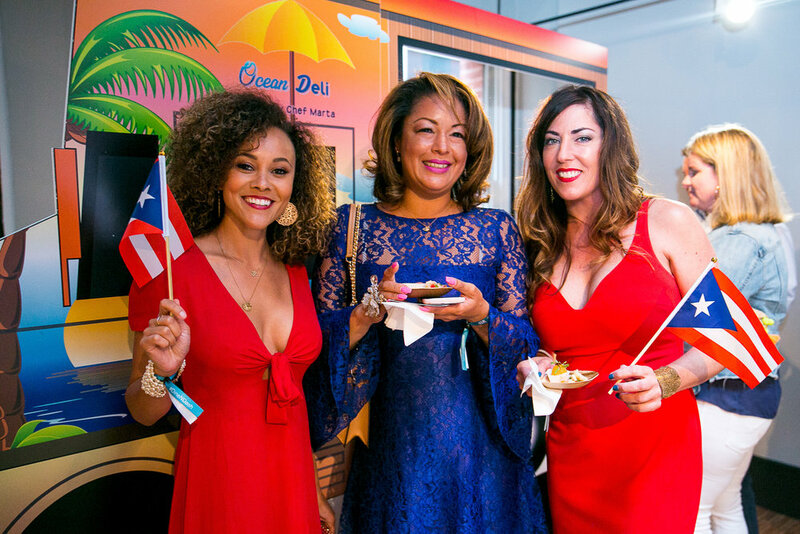 Each year celebrity chef Jose Andres hosts annual summer culinary event, Dine N' Dash benefiting his nonprofit World Central Kitchen. For one night, guests were able to leave their wallets at home and enjoy endless food and drink in dine-worthy Penn Quarter and 14th Street neighborhoods of Washington, DC. RGI was brought on to handle the design, planning, management, pr/marking, and on-site execution; including the recruitment, training, and management of 150 volunteers. This corporate event was different than most, in that our team wasn’t just running one large scale event in a single venue, but rather managing 39 different events, in 39 different venues, including guest registration and attendee management, staffing, entertainment, print materials, food and beverage, and much more across the city simultaneously, including a VIP kick-off and closing party to book end the evening. 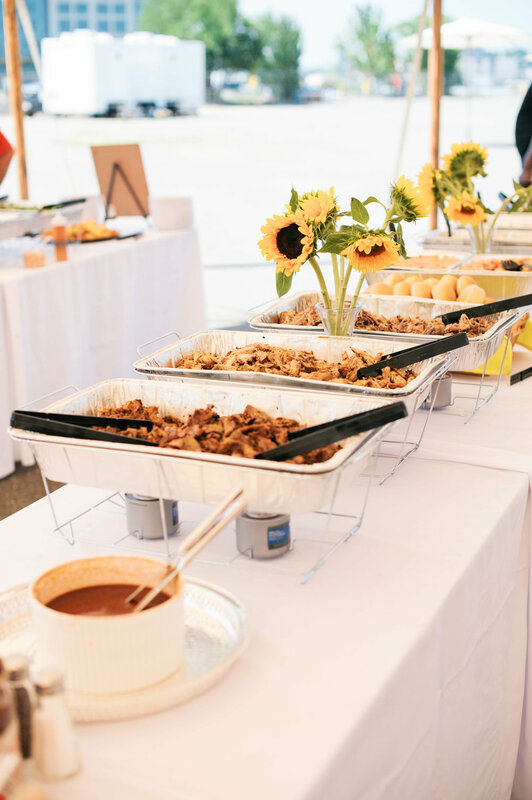 Founded by Andres in 2010, World Central Kitchen has paved the way among chefs for philanthropic endeavors numerous times in the face of disaster. This year’s event celebrated its most recent accomplishment in feeding over 3.5 million victims of Hurricane Maria in Puerto Rico, making it the largest hot-meal emergency feeding operation on the island, an aspect RGI wanted to translate into the event. The event proved to be a huge success garnering lots of media coverage and raising over $600,000 for the charity. - small steps which enhance a guest's experience - makes them feel welcome and leaves them with a lasting memory of the gathering . In this series of blog posts 'ALL IN THE DETAILS'. We will be exploring some of RGI's FAVE tiny touches, which we have brought to life for our clients. First up, are these place cards with a twist ;) we were able to pull off with the help of the fantastic Laura Hooper and her team at Laura Hooper Calligraphy. No touch was too small to be overlooked at this intimate traditional New England-style Lobster Boil bringing together a stylish group with high-end tastes. We wanted to elevate this beautiful event, held under the setting sun on a private farm estate in New Hampshire to a super elegant, yet, comfortable evening for attendees. BUT one of our FAVORITE details we placed on the table that evening was the unusual, yet highly appropriate place cards - utilizing an aspect of the entree course to direct guests to their seats. The idea: Take a traditional accompaniment to the meal, the lemon, accenting just off the dock seafood in this case - and make it really shine. We enlisted Laura Hooper to lend her fantastic talents to bring it to life. It required some event engineering - testing different paints and markers on lemons, which were then frozen to ensure the lemons would stay preserved for transport from DC to New England, last a week in a refrigerator and the ink wouldn't be compromised in any way. The atelier freezer was filled with citrus to make sure we could pull it off - and we did! The final product received almost as many raves as the fresh New England seafood. Take a look below for some shots of this stunning soiree and our lemon production! When one of RGI's corporate clients wanted utilize their newly purchased parking lot to put together an event to celebrate and show appreciation for all of their employees & families - RGI wanted to take that opportunity and run with it! What better way to show appreciation and have a little family fun than to throw a summer carnival inspired event?! We couldn't wait to create this awesome, over-the-top environment for our client and guests - so we went big! In order to transform the raw, vacant lot space and achieve the goal of a high-end afternoon which was entertaining for guests – we knew it was going to take some serious creativity and logistical strategy. – not to mention, we only had about 5 weeks to pull it off – INCLUDING preparing the lot as an event site. This included necessary maintenance, temporary security fencing, landscaping and cleaning. The outdoor nature of the event posed unique challenges – not to mention the need to run water and power to the space for a complex technical set up and attendees necessities like portable restroom trailers. The project lived up to the challenge we knew it would be - but once we had preformed the necessary prep - guests arrived to find a gourmet BBQ lunch buffet, traditional lawn game area, lounge vignettes, 5 food truck food court, artisan cotton candy and lemonade stands, traditional carnival game arcade alley, kids face-painting and airbrush tattoos - along with caricature artists, DJ entertainment, video photo-booth – and, for guests 21+, RGI created a European Beergartien in the lobby of the client’s headquarter building where guests enjoyed tastings, upscale bar fare, outdoor inspired décor and traditional café seating complete with umbrellas. We brought in and installed 2 jumbo-oversized sailcloth tents for shade, added market umbrellas to lounge vignettes, and brought in a potable water truck at the last minute to power misting tents. – it was an event RGI is very proud of, through which we truly demonstrated not only our planning and production expertise, but our ability to pivot, work well under pressure, and rise to the occasion. We like to say we make the impossible, possible – and it showed at this event. We are so excited to debut a new conversation series on here on the RGI blog, Events 101! In this series we will lift the veil on special events tackling variety of different topics we hope you will find helpful when aiming to be the host (or guest) with the most! We kick off this series with a question our Commander in Chic Rachael Glaws gets asked all too often - What should I wear? Read on for her thoughts on Deciphering the dress code - or - seriously what am I supposed to wear?!? The excitement that comes with opening an invitation! The hand-addressed envelope arrives, shiny ink shimmering on textured, thick card-stock. You tear it open and admire the care that went into selecting the beautiful design. Your heart starts to quicken as you read the details of what promises to be a fantastic fete – and then it drops as the line ‘Attire: White Tie’ jumps out at you. WELL WHAT DOES THAT MEAN! Take a deep breath, and don’t panic. It’s true that the nuances between Business, Business Casual, After Five, Resort Formal, White Tie, Black Tie…you get the point … can tempt you to forget the whole affair. But before you do that, pour a glass of sav blanc and take a look at this handy guide to some of the most common terms of attire. Tea length or short dresses are appropriate for ladies (within reason, of course!) Feel free to put your personal style signature into the look while following that guideline. Class after all is ALWAYS appropriate. For the men, stick with a fantastic suit but with the formality level taken down a notch, push the envelope a bit with a pop of color in the tie, or even in the blazer. Occasion is your best dictator of course – but this directive invites revelry (hello, cocktail!!) so a bit of envelope pushing is just fine. Here is where I tend to see the most variation on a simple dress code. Thusly, it can be one of the hardest to decipher. If you would wear it to a job interview, its probably fair game for this one. The slightly less rigid Business Casual still calls for a bit of button up but with a stylish twist – think a sharp-shouldered blazer over a chic ankle pant. However, unless you work in PR, Fashion, Music or another edgier industry stay away from open toes shoes or denim. Leave those for the even less rigid Casual Chic where either of those items is sure to be a welcome style statement. If you’re still not sure what to don to a fantastic fete, a few rules of thumb: An evening wedding (beginning after 5pm), unless you are outdoors, will always be a formal affair. Let common sense be your guide and dress for comfort (4 inch stilettos to a beach bbq are probably unnecessary – and a waste of a great shoe!). Ask yourself what your mother would say before you walk out the door and it’s ALWAYS better to slightly over dressed, than underdressed. And for dress code tips down to a science – check out the guide from Miss Manners herself, Emily Post, (Attire Guide: Dress Codes from Causal to White Tie) on the subject. Now put this on, and dive into your closet! Biggest Challenge: A last minute venue change which allowed RGI to shine through creative problem-solving and quick thinking. Don't worry, the show went off without a hitch! This corporate client has built a worldwide brand based on the values of localism, sustainability and environmental consciousness. RGI wanted to take those values and translate it into an event that their newly hired U.S. employees could easily relate to in celebration of their U.S. expansion. We wanted to create an atmosphere which was fun and laid back yet elegant and upscale - further engaging employees in our corporate client's mission and goals. RGI conceptualized an indoor garden party taking the best parts of an outdoor soiree within their headquarters building. Guests enjoyed traditional lawn games such as corn hole, oversized JENGA and horseshoes (all branded in our corporate clients logos and colors of course!) Decor consisted of lots of leafy elements including a 10 by 20 foot boxwood wall with custom logo cutouts. Guests enjoyed a fresh seasonal menu accompanied by cocktails courtesy of Heirloom Catering. Sweet Root Village was on hand to provide fabulous floral accents in a green and white palette. We created lounges throughout the space for guest seating consisting of baroque-style patent leather furniture an amalgamation of classic and contemporary. Guests also enjoyed a DJ courtesy of Bruce Pike Productions who also added lighting elements to enhance indoor ambience such as bistro lights. Last, but not least, Fabrications Events covered the floor in artificial turf to further create an outdoor experience. Scroll down to check out some photos from this corporate grand opening! RGI's Favorite Creation: The 8 foot tall by 16 foot long portable plexiglass structure representing the statistics our non-profit client's programming is trying to combat. Biggest Challenge: Figuring out how to construct the 8 foot tall by 16 foot long portable plexiglass structure representing the statistics our non-profit client's programming is trying to combat. One of the many things that makes RGI events + public relations so unique as a production partner is the fact that we are not JUST a planning and design team, but we also highly emphasize the organizational messaging of our clients - making it our goal throughout an event to continue bringing the focus back to the organization and it's objectives. Through our priority of 'materializing the message', RGI events + public relations utilizes the event as a vehicle, in order to make it as impactful as possible for the attending guests. The conceptualization and creation of unique messaging opportunities through sensory mediums attendees can see, touch and feel creates a very special, emotionally resonating and powerfully impactful experience that the guests can walk away with and remember. Engaging attendees through event is a must for success across the board. RGI had the opportunity to bring our unique messaging strategy and design to life in the entrance foyer of the Andrew W. Mellon Auditorium for one of our our non-profit clients, Project HOPE, at their Annual Project HOPE 2016 Awards Gala. Utilizing the theme for this year, Make Hope Happen, as a guide - we set out to show in larger than life ways just why and HOW that sentiment was important for attendees. We worked with our graphic design partners to put together custom multi-media projections on 8 oversized LCD screens throughout the room cycling through a series of results oriented statistics from Project HOPE's programs around the world. Further, exhibiting for attendees the impact their donations can make. This was also an important moment to show corporate and long-terms donors just how much their 2015 giving has accomplished since the last gala. While the statistics on Project HOPE's work are plentiful - they are also massive - both in the problems they combat and the results they achieve. We wanted to give the attendees a physical understanding of just HOW massive the efforts the organization is mounting to continue to combat HIV/AIDS in Africa must be. To that end, we designed and headed up fabrication on an 8 foot tall by 16 foot long portable plexiglass structure, which we filled with 7,000 branded blue plastic balls and covered with custom stencils. This represents the number of HIV cases diagnosed in an area of focus for our non profit client within the span of a week and helps attendees visualize the true magnitude. Highlighting further the urgency of the problem - we broke down that stat to illustrate how many cases that meant would be diagnosed JUST during attendee's time at the gala. -and of course - we washed the foyer in branded lighting color and patterns, highlighting messaging stations, accented by beautiful, modern, floral arrangements -to tie the space together. Want more? Check out the pictures below! Venue: Long View Gallery, Washington D.C.
Biggest Challenge: Weaving organization's messaging through this event for an audience of philanthropic minded young professionals in an engaging yet authentic way. RGI was brought on board by the NextGEN Leadership Board in 2014 prior to the organization's launch in New York City. After RGI's successful production at Midtown Loft and Terrace in Manhattan last summer we were retained to build the Board's outreach strategy through special events continuing in New York City and expanding to Washington, D.C. Beginning in 2015, RGI created and executed the Board recruitment strategy got the Washington, D.C. Chapter as well as the planning, production and design of D.C.'s Marquis event and the NextGEN Junior Gala in May of 2015. The goal of this Gala was not only to make money for this organization, but to engage and retain an audience to expand the NextGEN Chapter in Washington, D.C. In order to do that RGI placed priority on NextGEN's organization messaging by weaving touch-points through the event so that while participants could enjoy the different aspects that were provided, attendees were exposed and encouraged to pledge their support to the organization. Event highlights included: an artisan cocktail custom action-oriented libations to attendees, international themed hor d'oeuvres, a multi media moving picture photo booth, Moroccan style lounges and decor and an airbrush tattoo bar where guests were adorned with NextGEN's tagline and logo for the remainder of the evening. The centerpieces was a custom 20 ft poster where the organization's representatives encouraged event attendees to make an emotional pledge to support action across the globe. Scroll down to see some snaps of this evening! Venue: Carnegie Library Washington, D.C.
Biggest Challenge: Figuring out how to rig all that draping without nails, screws or staples. We are always so excited to return to the Carnegie Library - so when a private philanthropist entrusted RGI with the sixth year of his opulent holiday soiree, which, in addition to treating attendees to an awesome time - gives back to a local charity every year, we were of course, #stoked. To bring to life the client's inspiration (taken from the Gardens of Versailles) lead designer Rachael Glaws, Principal (and Commander in Chic) at RGI event + public relations took her cues from fabled gardens of all kinds and took on the challenge of brining the outside, inside. The event was designed around a palette of bold gold, greens and sleek white. Guests entered through a tunnel of greenery custom built on the steps of the Library, inspired by the entrance in the great literary work 'A Secret Garden'. Once through the doors candle installations flanked two columns supporting ornate draping and an oversized chandelier. 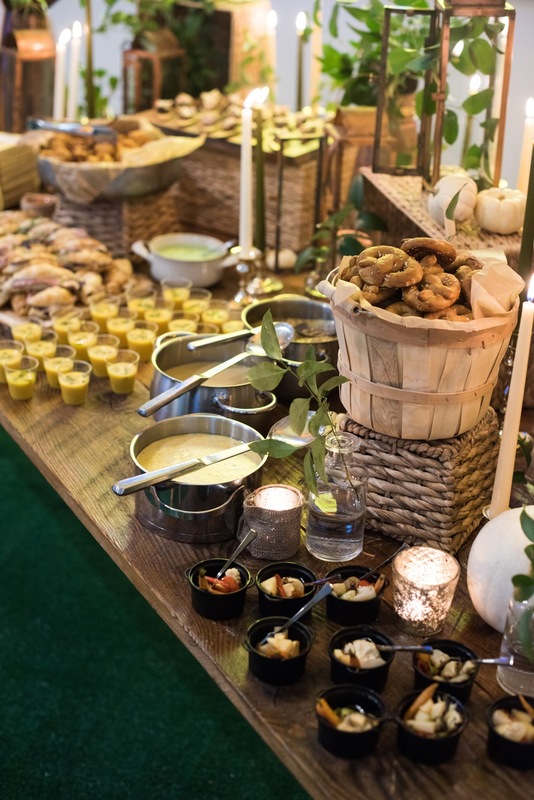 Throughout the room RGI added in lush garden inspired decor such as: tree trunk side tables (painted gold of course), custom built bar canopies draped in green garland and sparking votives (courtesy of our great friends at Sweet Root Village) served as fascinating focal points. Guests were delighted by small details such as the organizations logo laminated in gold glitter on the dance floors, as well as prominently displayed on napkins and custom lighting elements throughout the room. The theme carried through to food and beverage focusing on mini portions of favorite comfort foods. Guests also enjoyed a social media photo booth, interactive video DJ, bourbon tasting bar, champagne cocktail mixologist and a confetti cannon at midnight. 1,200 toys and gifts were collected for youth support with the help of our hosts beneficiary partner: Beyond the Barb. Scroll down for photos of this fabulous fete!